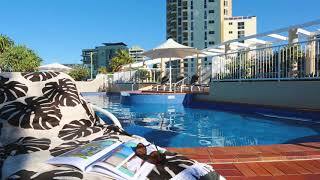 Situated in cosmopolitan Main Beach, Xanadu Main Beach Resort is the perfect location for your Gold Coast holiday. Xanadu Main Beach Resort offers fully self-contained apartments with the option of, one and two bedroom ocean-view apartments and two bedroom ocean-view superior apartments. All are air-conditioned and boast fabulous ocean views! They also have several low floor, two bedroom garden apartments. The beachfront locality is complemented by the resort's onsite facilities including an indoor heated swimming pool and spa, outdoor swimming pool and spa, gymnasium, tennis courts, air-hockey and foosball tables, library and much more for all to enjoy. Relax at the resort or enjoy all that Main Beach and the Gold Coast have to offer. Xanadu Main Beach Resort is the ideal location for couples and families who want to holiday close to the action and excitement without the noise and stress of the tourist strip. Fully refurbished, large two bedroom, two bathroom apartments located on the higher levels and boasting spectacular views. All apartments are air-conditioned and fully self-contained with everything you need for a fantastic Gold Coast getaway. Perfect for families or two couples. Spacious one bedroom beachfront apartment boasting spectacular ocean views. All apartments are air-conditioned and fully self-contained with everything you need for a fantastic Gold Coast getaway. Modern furnishings, large two bedroom, two bathroom apartments located on the lower levels with private balconies and views of the landscaped gardens. All apartments are air-conditioned and fully self-contained with everything you need for a fantastic Gold Coast getaway. Perfect for families or couples. Large two bedroom, two bathroom apartment boasting spectacular ocean views. All apartments are air-conditioned and fully self-contained with everything you need for a fantastic Gold Coast getaway. Perfect for families or two couples.